One of the bigger misunderstandings in the church today is how some people believe that a personal relationship with God is a private matter. To these folks, to follow Jesus does not mean that you follow Him into a personal experience with other believers. They placed their faith in Jesus and His work on the cross because they wanted Him to regenerate them. 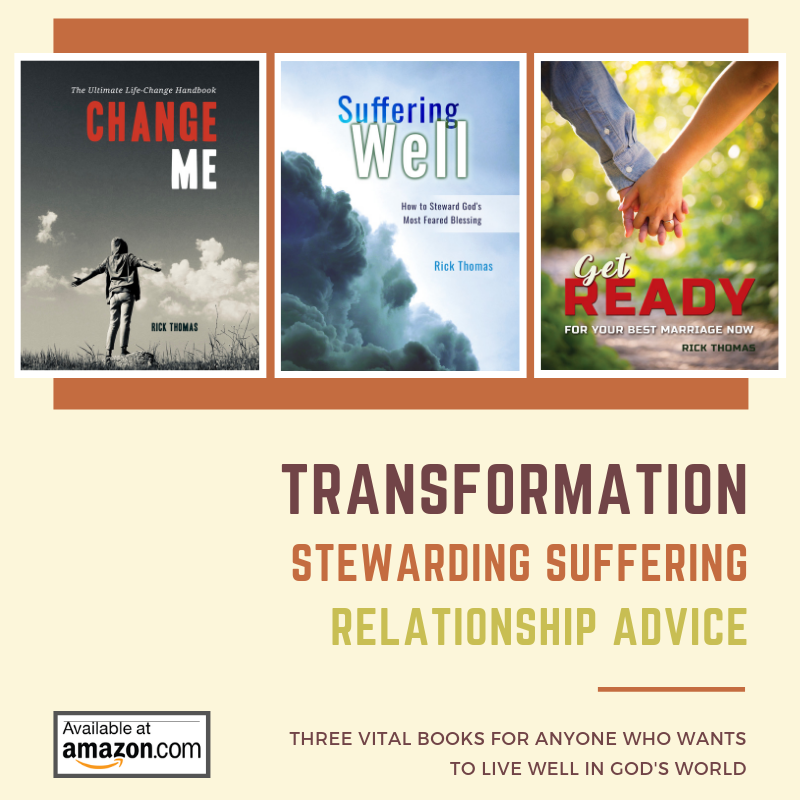 They knew how they were a mess and needed God to personally and powerfully impose Himself into their lives so they could experience transformation. They asked the Lord to redeem them from their guilt and sin. From there, a relationship with Jesus began. But what they did not realize is how the Lord wants them to have more than an experience with Him. It is a fantastic thing to be able to enter into a unique relationship with God Almighty and for Him to impact your life. This “benefit of grace” is the most profound personal relationship that you can have, but it was never meant to be a private, isolated relationship, detached from the community of faith. To become a Christian is to become part of a body of believers: other people who have experienced salvation and are on their path of following Jesus (John 14:6). This fantastic opportunity means that when you become a Christian, you are called to “get personal” with other believers. This concept implies more than a weekly corporate meeting at a church building. 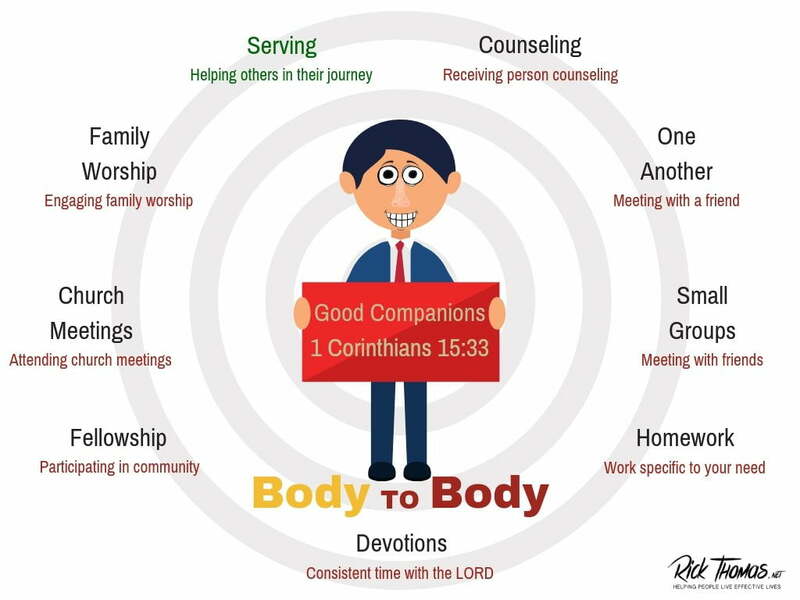 Did you know God has called you to an “everyday, personal, relational ministry?” The Lord not only gives you a unique relationship with the Trinity, but He also gives you a communal experience with His body. There are over thirty “one another passages” in the New Testament because you are a person in need of change. And God has called you to help other people who are in need of change. Listen to the seriousness of this call for “reciprocal soul care” from the Book of Hebrews. There is a strong appeal from God’s Word for you to have an “every day, every person ministry.” The Hebrew writer warns us with a sobering clarity of what can happen if we don’t obey God this way. We live in a deceptively sinful world, and none of us can withstand the hardening effects of sin if we isolate ourselves from the community of faith. You are called to bring biblical counsel to your fellow believers regardless of how long you have been a Christian. All of us are called to help others in their time of need (Hebrews 13:3). The gospel is about going and affecting lives (Philippians 2:6-11). Sanctifying soul care is one powerful way that we can imitate Christ (Ephesians 5:1). When times of trouble comes or when someone is discouraged and is in danger of being overcome by their circumstances, people within the body of Christ should automatically mobilize to help. The church is a “sanctification center” where each person within a local body is called to bring care to each other (Romans 15:14). If we don’t do this daily through personal ministry, there is potential to be hardened by the deceitfulness of sin. Nearly every time a person comes to me for counseling, that individual has been disconnected and isolated from the local church. Even if they attend their local church meetings, they do not adequately engage their church. In some of these cases, their community does not properly interact with them. When these scenarios happen, you can guarantee that the deceitfulness of sin will begin to rule their minds. We’re all vulnerable. As long as we live in Adam’s body, we will be tempted to sin and be deceived by sin. If you are not adequately addressing your sinful temptations in a community setting, you will be susceptible to a hard heart. This reality is why it’s imperative for the church to understand the potential of drifting from the Lord. The quickest way to be hardened by the deceitfulness of sin is when you do not get what you want. If you don’t address your sinful responses to disappointments, a regression regarding a sensitivity to the things of God will begin to take over your thoughts. The first step in this regression will be a waning desire to read God’s Word. Simultaneous to this reaction to the Bible will be a cessation of your prayer life. After a while, you will distance yourself from another one of the primary means of grace that the Lord gives to us: the community of faith. When this person comes to me, the Bible and the prayer closet has grown cold, and their local assembly is not part of their “process of change.” Their hearts are hardened. This scenario happens incrementally. The hard heart hardens by the ongoing disappointments in a person’s life while not being in tune to the deceitfulness of sin. Spiritually blind people are not only blind, but they are blind to their blindness. You don’t know what you don’t know, and if someone is not speaking into your life, you’re set up for personal failure. You will never outgrow your need for the body of Christ to speak into your life. A wise response to keep from falling prey to the deceitfulness of sin is to find a community of believers who are interested in helping each other look into the mirror of their lives. Knowing the real truth about ourselves is critical. We’re all like the guy who first hears himself on audio. He asks, “Do I sound like this?” Everybody in his life knows how he sounds. The problem is that he does not have anyone to love him enough to tell him how he sounds. This problem becomes exponentially more severe when we’re talking about sanctification rather than an audio recording. An individual without a small group of friends speaking into his life is working without a net. This condition is foolish and unbiblical because sin is no respecter of persons. Like a lion crouching at the door, sin is always looking for a way to enter (1 Peter 5:8). This reality is warfare where there are real casualties. Marriages break apart, children blow up, and the “lion of sin” ravages lives. A wise response is to accept the fact that you’re blind to your blindness. Ask the Spirit to help you find people who are willing to help you see what you can’t see, which will not happen by wishing it. You will have to earnestly seek it. Nobody will love you the way you need to be loved. You’re going to have to find people to help you see what you can’t see about yourself. If you expect the church to do this for you, the church will fail you. This spiritual need is your job, not the church’s responsibility. Your church may provide you with a place to find your community, but you must engage that community with the intent of building in-depth relationships. Too many Christians blame the church for their failures. Deception has captured their hearts by setting themselves up as victims. Don’t be naive. If you want a community to help you grow, you must lead this initiative. The wise person will not only look for gospel-motivated communities to help him mature in Christ, but he will position himself to be this kind of caregiver. There is always someone that you can build a relationship with so both of you can benefit from each other. The difference between foolishness and wisdom is the difference between the person who complains about a problem and the individual who does something about an issue. Ask the Holy Spirit to give you insight and discernment so you can perceive what is going on in your lives. Ask Him to provide you with a sensitivity to see what He sees (Hebrews 4:13). Then act upon what you perceive the Spirit is leading you to do (James 4:17). If you don’t obey the light that He is giving you, don’t expect Him to provide you with more light. You must walk in the light with Him, and if you do, you will begin to enjoy a special kind of fellowship with His body (1 John 1:7-10). There is no other choice for “every day, every person ministry.” Though there may be some discipleship situations above your pay grade and you may need to seek out a trained discipler, there is no doubt that you are to speak into people’s lives. If you don’t help those in need, you will relegate yourself to the category of the priest or the Levite in the story of the good Samaritan (Luke 10:25-37). You see the hurting, but you pass by because serving the body of Christ is not a priority for you. You’re not an exception to the warning no matter how exceptional you believe you are. If you’re not pursuing community, while appealing to the community to pursue you in your sanctification, you are unwise. If you don’t have a friend like what I’m describing, it’s time for you to find one. Perhaps we can be a “temporary friend.” It’s not the best choice, but we can serve you in a limited, cyber-way. In the meantime, ask the Father to bring someone into your life who will love you enough to speak the truth into your life. Do not delay. Pray now. Your “sanctification life” is dependent on how you respond to what I’m saying. If you don’t heed the Hebrew warning, there is imminent danger ahead of you. These three question will serve you as you reflect on these ideas (Hebrews 10:25). Where do you see Christ at work in the things that you’re dealing with today? How is your heart doing in all of the challenges in your life? Are you able to rest in the gospel? If not, why not? What if the “culture of your church” and your small group of friends believed in “every day, every person ministry?” Imagine if you were brave enough, intentional enough, and compassionate enough to participate in this level of soul care. Think about how many marriages that could experience transformation. Think about how many lives would experience change. What if the body of Christ stepped up to the compassionate call to come alongside each other for His glory and their mutual good? God has made you competent to do this kind of every day, every person ministry (Romans 15:14). Will you be humble yourself to pray, asking Him to use you and other people to speak into your lives so you can mature in Christ? It does not matter if you are unsure what it means to “speak into each other’s life.” What matters at this point is your willingness to serve Him and His body by stepping out in faith, asking God to give you opportunities to build a relational community.